sure things get slow in the summertime, or maybe busy, who knows, but it's always nice to take some time out to visit your friendly neighborhood OWC. there's stuff there, like book reviews and cool videos and other stuff too. it's a nice place. 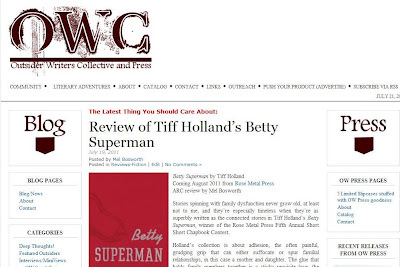 recently i reviewed Tiff Holland's forthcoming Rose Metal Press book Betty Superman there. you should go check it out. drink lots of water. it's summertime. it's hot out there.